Michael's tribute to Charlie Chaplin's beloved Tramp. This painting presents Charlie in a way we've seen him before (on black-and-white film) and in a way we haven't (with full color, photo realistic eyes). Of Charlie's eyes, comedian Stan Laurel said, "he had those eyes that absolutely forced you to look at them. They can dominate anyone they look at. That's part of the secret of his great success—eyes that make you believe in him in whatever he does." Michael would like to extend a special thank you to Josephine Chaplin, for offering advice about her father's eye color. 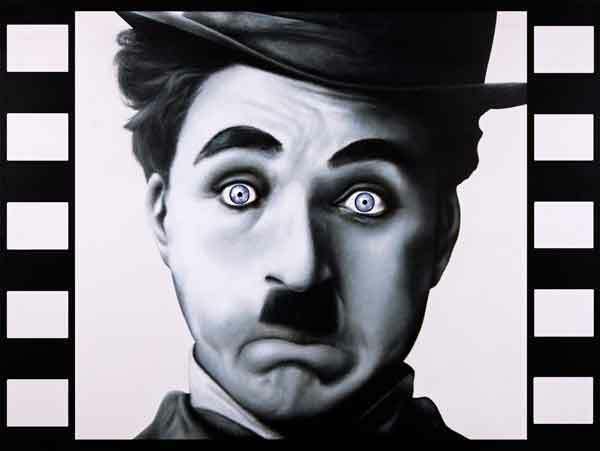 The Charlie Chaplin portrait is being offered as a giclée on museum quality fine art paper, with the limited production of 82 (the number of films Chaplin made) signed and numbered pieces. The prints measure 22" x 29". Artist&apos;s note: Michael is grateful for the generous permission of the Chaplin family, of his painted rendition of a Chaplin Estate photograph.